The container lines CMA CGM and MSC have followed Maersk’s lead to announce new BAF surcharges that will be applied from 1 January 2019. The carriers’ moves come in anticipation of the IMO’s tightened 0.5% sulphur cap for marine fuel. To be implemented from 1 January 2020, the new regulation is expected to result in significant bunker cost increases for carriers. The announcements have triggered a wave of fresh complaints from shippers, who claim that the carriers failed to address concerns of profiteering. A longstanding criticism of shippers is that the carriers’ methods of calculating BAF remain intransparent, lack uniformity, and could involve an element of revenue generation, rather then serving only to recoup actual bunkers costs and help carriers cope with unexpected fuel price fluctuations. Carriers’ current practices have not helped in dispelling shippers’ concerns. Maersk’s existing SBF tariffs doe not accurately reflect actual fuel costs, a point that the carrier had conceded to Alphaliner. Maersk also confirmed that both their current SBF and the new BAF are not set according to a base bunker price. This goes against the original principle of the BAF. The factor had first been adopted in 1974, following the first oil crisis. It was intended to apply only when bunker costs rose above a certain base level and the carriers were to cover bunker themselves, whenever fuel prices would fall below this base level again. According to Maersk, the carrier’s BAF/SBF calculations no longer set a base bunker price, and thus would not fall to zero, regardless of fuel price. Continued lack of transparency and consistency of how BAF is calculated by carriers risk further calls for the surcharge’s abolition. Carriers need to incorporate all of the component factors that would affect their bunker fuel costs, in order to dispel shippers’ concerns. BAF calculation will remain highly complex and individual carriers will have different approaches on how to calculate the surcharge. However, the calculation formulas proposed by carriers have so far failed to provide sufficient information to put concerns to rest. The fuel price to be used will be based on high sulphur fuel (IFO 380) in 2019 and will be switched to 0.5% LSFO from 1 January 2020. The Maersk BAF tariff will be reviewed on a quarterly basis and will be adjusted only when fuel prices change by more than $10/ton. However, the tariffs could also be adjusted monthly if the fuel price changes by more than $50/ton. According to Maersk, the ‘Trade Factor’ will be based on actual fuel consumption per container moved on individual tradelanes. In addition, it comprises an imbalance factor that would apply a larger share of the fuel costs to the headhaul leg than the backhaul leg. How will savings from the use of scrubbers be passed on to shippers? How will savings over time from the use of larger ships and from slow steaming be reflected in the BAF calculations? How will changes to the trade imbalance over time be reflected in changes in the trade factor?How will headhaul shippers ensure that they are not unfairly penalised with a higher share of the fuel costs when they already pay higher ocean freight rates than backhaul shippers? While Maersk’s latest attempt to reset the BAF debate with the publication of its new BAF formula is a good start to its previously opaque and unjustifiably high SBF tariffs, carriers will need to address shippers’ concerns head-on by providing better visibility of the total fuel related costs. Previous attempts to impose BAF have failed, mainly because of the surcharge’s inconsistent application, with all-in freight rates continuing to be applied for the majority of the market. 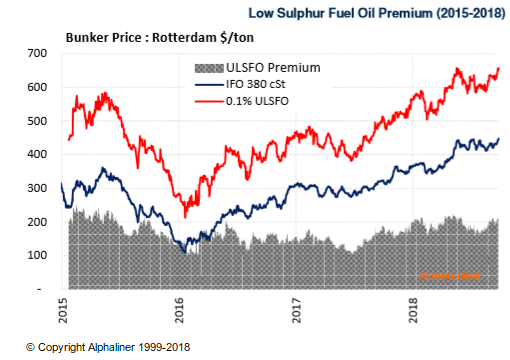 Carriers cannot afford to allow this to continue, as the 2020 sulphur cap is expected to raise overall fuel bills quite significantly.